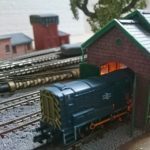 Adding that sought after ‘authentic’ feel to a model railway usually involves slow, intricate and detailed model work. 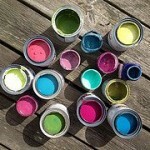 But here’s a quick, easy, and often overlooked action you can take that’ll bring a dash of realism without glue or paint. Hint, it involves rubbish. 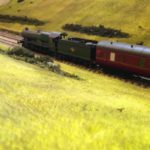 While on my way to the STEAM GWR museum for their Railway Festival recently I was looking out of the train window when something caught my model making-eye. When traveling by train (which I do a lot) I always try to use the opportunity to make notes on the scenery, bridges and railway buildings that fly past for future reference. On this occasion, however, it was the track that got my attention. Or more accurately the gullies and sidings next to and in-between the tracks. As my train flew through the countryside on its way to Reading and then Swindon I noticed that the trackside was littered with debris from works on and around the rails. On subsequent journeys, I’ve kept a lookout and confirmed that it’s the same on pretty much every railway line. Whether it’s old or new track on station approaches, equipment, rubbish and discarded equipment can be seen lying around rusting away. The picture to the right is just one example of old rails left next to the track at Woking in Surrey, which I pass on my daily commute. 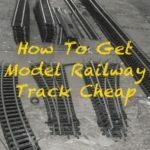 I’ve commented on this before but seeing it on my journey reminded me how common this is and how adding such items to your track sides would be a quick, easy and simple way of adding extra realism to your model railway. 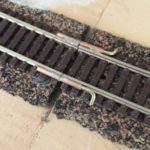 Old rails, sleepers, sandbags, axels, wheels and electrical cable coils are all prime candidates for trackside debris you can easily add. 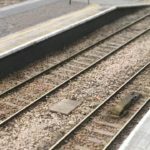 Rails and sleepers left by the side of tracks can be obtained from spare track you have lying around, although obviously of the same gauge as your laid track. 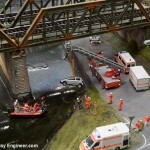 The picture at the top of this post shows this done to brilliant effect on the Miniature Wunderland in Hamburg. 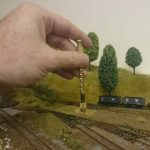 One final thought, if you have fences (see the previous post on model railway fencing) by your railway lines make sure the rusting rails etc are places inside of the fencing. The fences are there in part to prevent railway works spreading onto nearby land. I’d love to see how your layout looks before and after you’ve added trackside building materials. Tweet or send me your pictures.